With an electric mixer, beat the butter and sugar on high until light and fluffy, 3-4 minutes. Add the lime zest and mix for about 1 minute. Add the eggs one at a time, mixing after each, then the vanilla extract. In a separate bowl, combine the flour, cornmeal, baking powder, and salt. Add to the wet ingredients and mix until just combined. Place rounded tablespoons of dough on the prepared sheet pan about 2 inches apart. Gently press each ball with the palm of your hand to flatten slightly. Bake until the edges are just turning golden brown and centers are still pale, about 17-20 minutes. Do not over bake. Let cool on the sheet pan for 15 minutes, then remove to a cooling rack to cool completely. 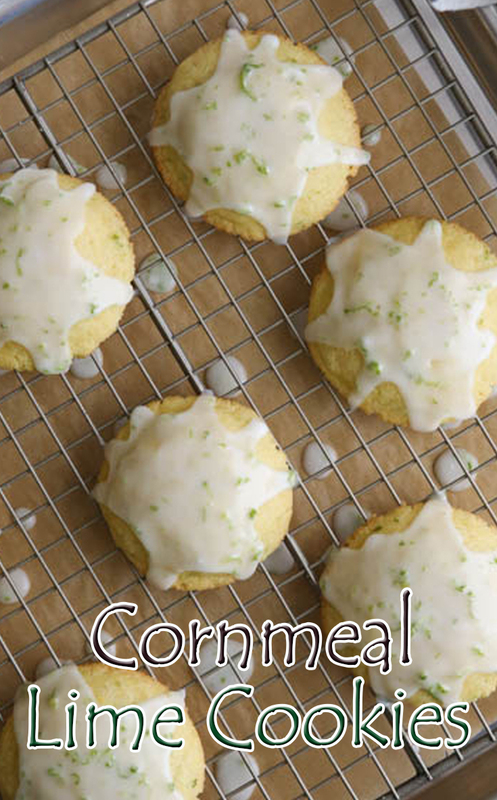 To make the glaze, whisk together the powdered sugar, lime zest, and lime juice. Add milk 1 teaspoon at a time to reach the consistency you want. It should be thin enough to spread over the cookies. Glaze the cookies on a wire rack with a sheet pan placed underneath to catch excess glaze. Let the glaze harden for several minutes before serving. These cookies are best served the day they are made, but will keep in an airtight container at room temperature for a few days.